We attended CES2014 and wrote up some notes to share with our team when we got home. We thought others might find these useful too - so here's a summary. We’re mainly interested in waterproof devices and sports and fitness so it’s written from this perspective. 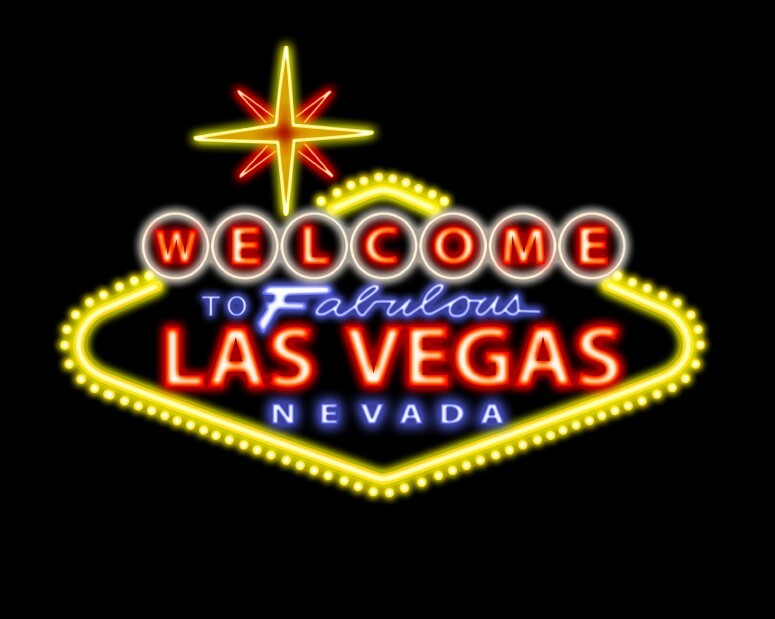 Quick note to say AiT will be at CES this year with our friends from Speedo. If you want to meet up please get in touch. We'll also post a run down of the show afterwards. We're all really excited to see the Michael Phelps Swim Challenge finally appear on the Speedo Fit app. Things have certainly come along way since Splashpath days! Accompanying the virtual challenge is a great promo video Sally at Speedo put together including an interview with Michael. Well worth checking out. As part of our wearable devices project we've been collecting gigabytes of swimming data. This month the team were in Spain and took the opportunity to collect some more sets in the hotel's 25m (unheated) infinity pool. It was early in the morning and at the end of October - so best described as "refreshing". Here's Jude on her first of many freestyle sets - if you look carefully you can spot Dan bravely jumping in about to start his. Dan and Ben spent two weeks in China preparing for the launch of Speedo Fit China testing our system architecture and tweaking server config to reduce latency - but naturally, taking the opportunity to get some swims in. 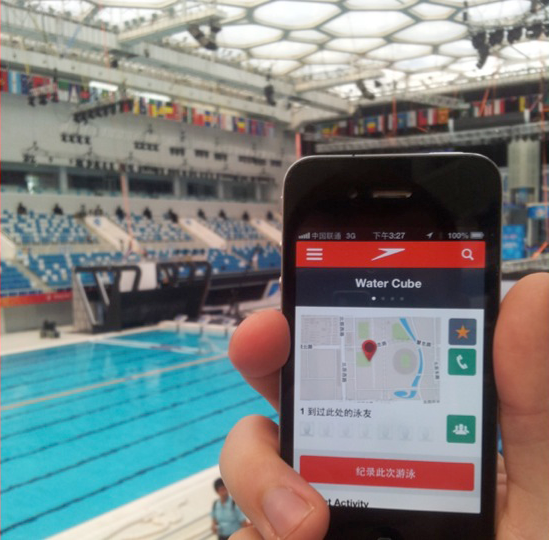 The app, and Ben's hand at the Beijing National Aquatics Center aka The Water Cube. It's Official. See Press Release below. We're chuffed. Active in Time Limited (AiT) makers of the Splashpath Swimming App for iOS have partnered with Speedo International Ltd, the global swimwear brand to launch a new mobile app for swimming fans. Splashpath began over two years ago when Dan Morgan, a passionate swimmer became frustrated that the App Store was awash with apps for runners but ‘there wasn’t an app’ for swimmers. Dan joined forces with The Leisure Database Company, a leading authority on leisure and sports data. Together they developed Splashpath mobile app which helps people find their local pool and track their swims along with a sports operator timetable solution which enables pool operators to update and publicise their swimming timetables across the web and in the Splashpath App. Since the launch of Splashpath the community of swimmers and operators has grown to become the UK’s leading swimming app and in 2011 was the Number 1 Health & Fitness App in the UK App store. Today, Splashpath users are swimming the equivalent of Dover-to-Calais and back again, 7 times each day. The partnership between AiT and Speedo International Ltd will see the UK Splashpath App receiving a significant update including new name, design and features. Speedo will also launch the app internationally starting in China followed by Europe as an integral part of their new Get Speedo Fit initiative. Active in Time is a classic story of the internet age - from bedroom to boardroom. Started by Dan Morgan asking why there isn’t an app for swimming fans. Dan met The Leisure Database Company a leading authority on Sport and Leisure data and together they worked on Splashpath swimming app which was released in 2010. Today Splashpath is the UK’s leading swimmer’s engagement and operator timetabling platform. The Splashpath iOS application is a unique way to find your local pool but also helps motivate swimmers by enabling them to sign up to a virtual challenge then track and share their progress on social media. 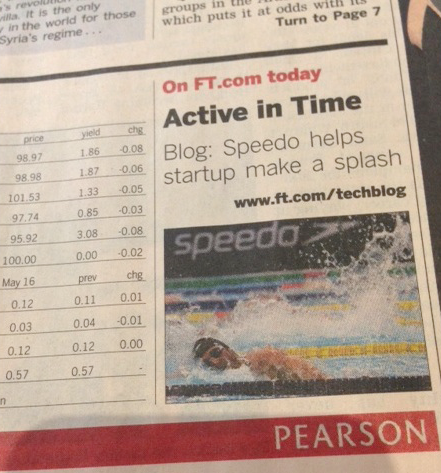 The timetabling platform is used by pool operators to update and publicise their swimming timetables. In December 2012, AiT released GymJam, a mobile health & fitness application helping people find their local gym classes and recently introduced AiT Voice - an automated telephone service for leisure operators. AiT is a Tech City startup based in TechHub @ Google Campus. The world’s leading swimwear brand, Speedo is passionate about life in and around the water, creating revolutionary new technologies, designs and innovations and supporting swimming from grass-roots through to elite level, including the phenomenal Michael Phelps. In the 1920s Speedo made history with the Racerback: the world’s first non-wool suit. In 2008 Speedo redefined swimwear again with Fastskin LZR RACER - the fastest and most technologically advanced swimsuit ever created. 2011 saw Speedo unveil another world first with the Fastskin Racing System - a cap, goggle and suit designed to work together as one. Speedo is owned by Speedo Holdings B.V and distributed in over 170 countries around the world; to find out more visit: www.speedo.com. SPEEDO, the ARROW device, FASTSKIN, AQUALAB, RACING SYSTEM, SPEEDO BIOFUSE, SPEEDO ENDURANCE, SPEEDO SCULPTURE and LZR RACER are registered trademarks of Speedo Holdings B.V. The LZR RACER suit has worldwide design rights and patents. The FASTSKIN3 cap, goggle and suit has worldwide design rights and patents pending.